Flemish still-life and flower painter. He was baptized on 24 Sept 1623 in Antwerp. In 1643/44 he became master in the Antwerp guild of St Luke. On 13 Oct 1647 he became a member of the pious bachelor society. In 1652 he collaborated with Erasmus Quellinus, who painted the figures in a Garland of Flowers and Fruit conserved in Norwich. 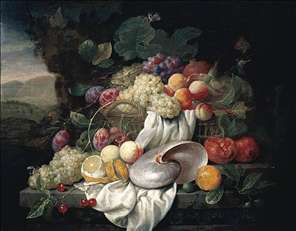 On 22 Oct 1656 he married and two years later had a son, Jan Frans van Son (1658-1718), who became a painter and lived in England where he developed a reputation for his still-life paintings of fruit and flowers with works that were similar to those of his father, but modified slightly for English tastes. Joris van Son s floral garlands reveal the influence of Daniel Seghers, although conceptually his still-lifes largely manifest his response to the work of Jan Davidsz. de Heem. However, in van Son s paintings the lighting is softer, resulting in a greater differentiation between diverse objects. His rendition of peaches is particularly noteworthy due to their realistically fuzzy appearance. 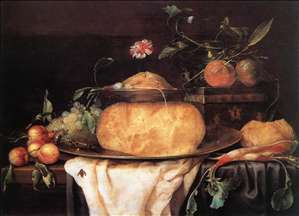 See more details about "Still-Life with Cheese"